Earlier this week, we received an industry update on an outrageous incident that happened at the California State fair in Sacramento. An escaped cow was shot 11 times and killed. The cow was supposed to be part of the UC Davis birthing exhibit which was planning to show the cow give birth to a calf. The cow apparently broke free early in the morning before the fair started, and the fair officials couldn’t catch her. Allegedly the officers said the cow was a danger to the public, and had no choice but to kill the cow. An officer had to shoot the cow 11 times to kill it. I am writing this to offer a dairymen’s perspective into this atrocious incident. Our entire family was outraged by this incident as were many other fellow dairymen that I have talked to since this took place. This is definitely not how you treat cows. Watching the video of the footage from news 10, the officers are chasing the cow down in vehicles, driving fast, and clearly not demonstrating great herdsmanship skills. Anyone who knows cows knows that the officers were clearly making the situation worse. The area at the fair where the cow got loose was fully enclosed, and the cow would’ve tired eventually. The fair officials should have clearly followed the advice of the fair vendor who told them to try catching her with a rope. I don’t think people should have felt any fear of their safety. Cows aren’t violent animals, and don’t attack people. The fact of the matter is that she could have been caught. It may have not been easy, but the officers cannot say they had no other choice. If we shot our cows every time they escaped, we would have very few cows left on the dairy. Many people are worried that there are antibiotics in their milk. It’s an important issue, and I can understand peoples fear. If you continually take antibiotics, you can build immunity, and the antibiotic’s effectiveness goes down significantly. That’s why it is imperative that there cannot be antibiotics in our milk, so we can use antibiotics when we need them! I decided to write this to help people understand the measures we take on our dairy to ensure a high quality product. I can say confidently that there are no antibiotics in any milk because it’s illegal for antibiotics to be in the milk. In fact, it is illegal to have antibiotics in the milk! Every milk truck that leaves our dairy is tested to ensure there are no antibiotics in the milk. Then when the milk gets to the milk processing plant, the milk is checked again to ensure there are no antibiotics in the milk. 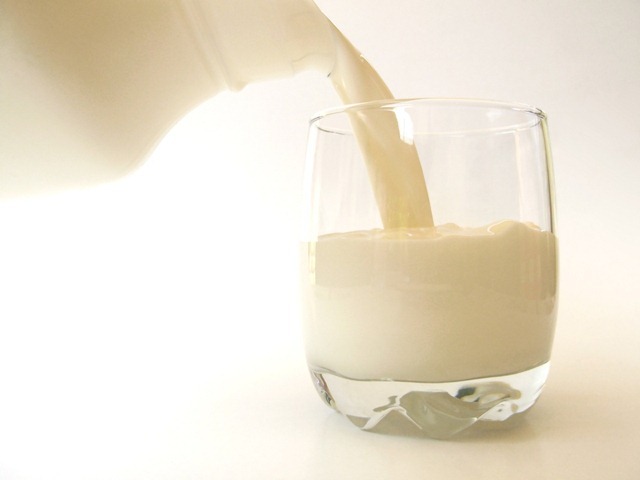 If milk is contaminated with antibiotics, the entire load must be thrown away. Dairies that send milk to their creamery with antibiotics are penalized, and if milk is sent with antibiotics more than 3 times, the dairy can lose their license to produce milk. This ensures that dairies make it a priority to make sure no milk they are sending has antibiotics. Besides losing our license to produce milk, we also suffer financially if antibiotics get in the milk. Milk with antibiotics MUST be dumped, and that’s milk that we don’t get paid for. Because of all the negative consequences of having antibiotics in the milk, we have set up strict quality control measures to make sure our milk remains antibiotic free. We use antibiotics on our farm to help our animals recover when they get sick. When the cows and calves get sick, we have a few different antibiotics on hand that can be administered to help them feel better. 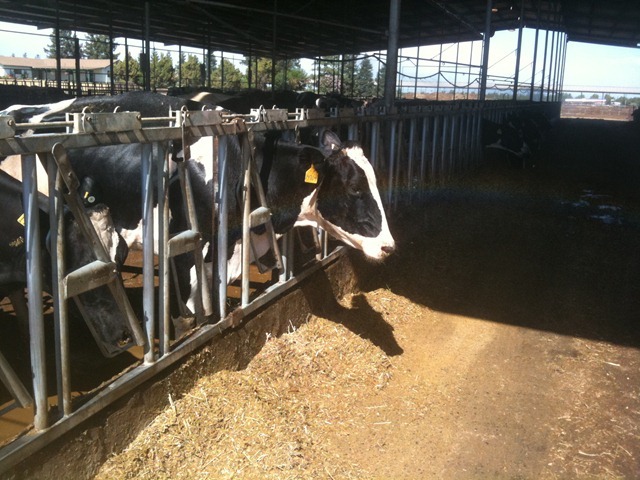 When a cow is diagnosed with an illness, she is moved to the hospital pen, and separated from the rest of the herd. Yes, there is a hospital at our dairy! The cow is then given the appropriate medicine. Our veterinarian also comes once a week to diagnose certain animals, and prescribe treatment. All of the sick cows receiving treatment are separated from the rest of their herd mates and milked in a different milk barn. On our dairy, we have 2 milk barns; the old barn my grandpa started with, and our newer barn we built later. So all of the sick cows get milked in the old barn, and all of the milk from the sick cows gets thrown away. It’s a great way for us to keep these two groups separate. All of the milking equipment and milk pipelines are separate from the barn where we milk all of our healthy cows. When cows are treated, we document the treatment in our computer records. When the cows are better and ready to move back with the rest of their friends, we hold them a bit longer in the hospital pen. Some antibiotics when given to the cow can be transmitted into the milk, so each antibiotic has a withholding period. The withholding time is the amount of time needed before there is no drug residue in the milk. After the cows is better, and they have been in the hospital long enough to have no drug residue in the milk, we move them out. But when we move them out, we use an antibiotic test that checks the milk for antibiotics. If the test is positive for drug residue, the cows must stay in the hospital pen. Only when we get a negative test for antibiotics do we move them out of the hospital. Good record keeping can keep antibiotics from getting into the milk, but we use the antibiotic test as well to make sure we didn’t make a mistake! It’s basic quality control. All milk when it arrives at the creamery MUST be tested for antibiotics. It is mandated by law that each truckload must be tested for antibiotics. 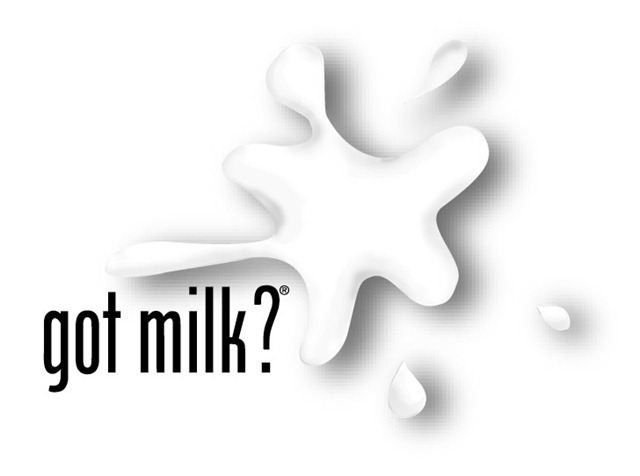 If antibiotics are detected in any truckload of milk, the milk must be dumped. Besides antibiotics in the milk being illegal, processors have motivation to have antibiotic free milk. 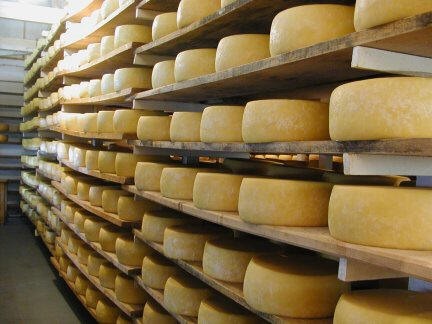 When making cheese, yogurt, and other cultured dairy products, the bacteria culture that makes the products can be inhibited from growing. If the bacteria don’t grow, you can’t make cheese, yogurt, or other dairy products! Because of this fact, cheese makers and other dairy processors are vigilant in keeping antibiotics out of the milk. When people talk about the differences between organic and conventional dairy farming, many people feel that organic is a “healthier choice” because no antibiotics are used on the organic dairy. But conventional dairies do produce milk without antibiotics too; it’s just a difference of management practices. Organic dairy farms are prohibited from using antibiotics on their farms. I feel that organic dairies are very cruel towards the animals in this way as there is medicine to help ease their suffering and help them recover faster. Withholding antibiotics from the sick animals only prolongs suffering and can even result in death if they are not treated. Put it this way, you get sick and the doctor tells you he has the cure, and you could be better in a few days if he gives it to you. But the doctor notes that you’re at a different hospital that believes everyone else in the world would be better off if you didn’t take the antibiotics, so they won’t let you take the medicine. Not administering any antibiotics is a way to prevent any antibiotics from getting into your milk, but you can use antibiotics responsibly on dairy cows and not have any antibiotics in the milk as well. I am not against organic dairies; in fact I have many friends who have organic dairies. But people must remember that organic milk is not necessarily better for you; it’s just a difference of management practices that are being used on the dairies. Three take facts to take away: antibiotics are used to keep cows healthy, antibiotics can be used responsibly, and they are kept out of the milk we drink. Consumers can rest assured knowing that dairies take pride in producing high quality milk that is free of antibiotics. It is illegal for dairies to have antibiotics in the milk, and this coupled with the potential financial loss of having antibiotics in the milk makes it a priority for dairymen to keep contaminates such as antibiotics out of the milk. On our dairy, we have put into place a various quality control measures to make sure we do not have any antibiotics in our milk (i.e. separate pen, computer records, and antibiotics test), and many other dairies have the exact same controls in place. It’s important that antibiotics don’t get in the milk, and we all can agree on this. But it’s also important that people understand the management practices we have put into place to keep antibiotics out of the milk at the dairy. I hope that this posting gives milk drinkers everywhere more insight to what we do at the dairy, and the pride we take in producing milk that is guaranteed antibiotic-free! When people think of dairy farming or any agriculture in general, most people would do not think of these industries as being technologically advanced, but they are. Over the past 2 or 3 decades, dairy farmers have integrated many technological advancements into the farm in order to maximize efficiency’s (just like any other business would do). And there have actually been many advancements in technology that have helped us become better dairy farmers. It’s really a fun time to be in the dairy industry with so many new technologies emerging. One of the newest technologies on the dairy is our tractor that has GPS. The GPS actually controls the tractor so it can make straight rows when it’s working in the field. The GPS has helped our farming practices become more efficient. The main goal of the GPS technology is to help eliminate wasted energy. 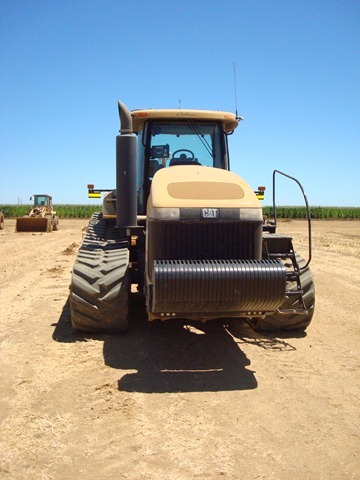 Using GPS, the tractor is prevented from overlapping the areas in the field it already went over with the tractor implement. The tractor is pretty simple to drive. You jump in, start it up, and turn on the GPS navigation. The tractor drives itself. You only have to do the turning! This technology has helped us become more efficient in the fields, and has benefited our farm in many ways. We save on fuel, labor, and our most valuable asset time. This in turn cuts the amount of fossil fuel we use at the dairy, and helps us produce milk more cheaply. 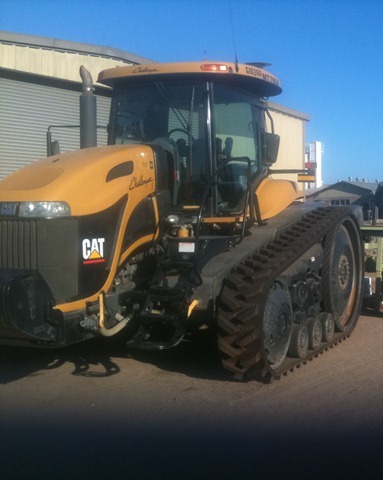 Tractors fitted with GPS technology is just one of the new and exciting technologies we use at the dairy. I’m planning on posting more about some of the tech we use at the dairy so stay tuned for more. As a dairyman and a farmer, it’s actually in our best interest to be caretakers of not only our cows, but the environment as well. It’s our job to be good stewards of the environment and we take pride in taking care of the environment around us. 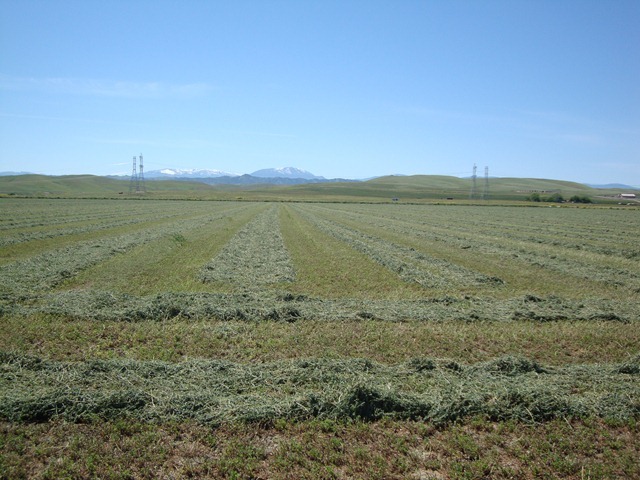 The above picture is one of our hay fields. Many people do not recognize that taking care of the environment is in our best interest, but it actually is. If we are careless towards the environment, it’s not like we can just up and move our farm. We have to take care of the environment because it’s where our family lives. Dairymen and farmers are often on the forefront of new technologies that can lessen the impact we have on the natural environment. One great example of how our dairy farm is cutting our impact is by using new farming technologies. 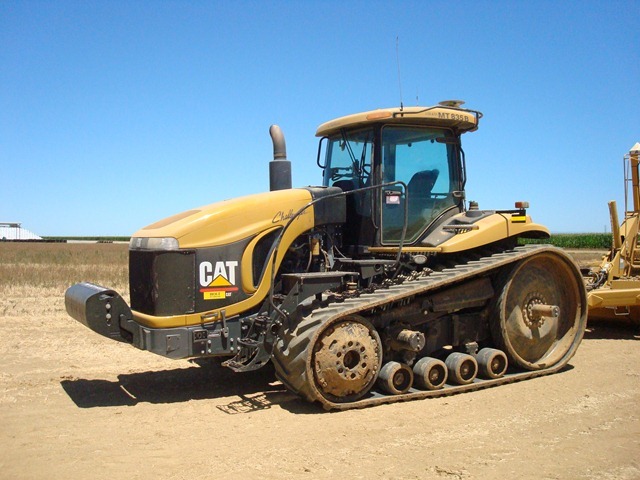 Better tractor equipment has been developed to allow for more efficient plowing. 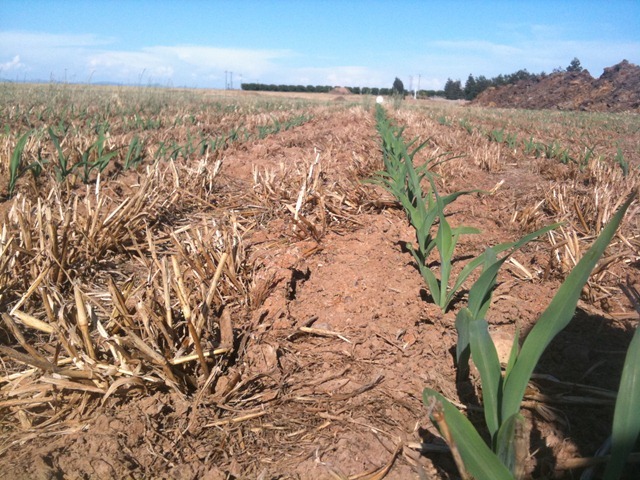 No-till and strip-till technology allows us to lessen the amount of work to till or plow the soil. 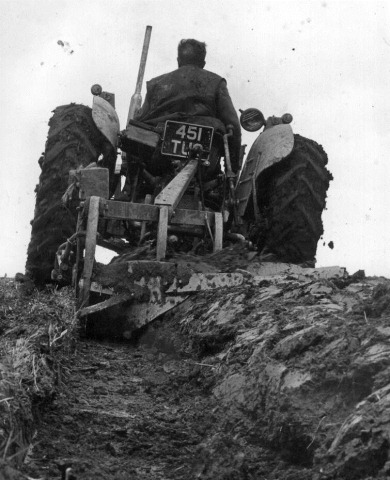 Before, the soil would be worked many times by tractors in order to break up the soil. Now we barely work the soil to plant our crops and it keeps our air cleaner. No-till and strip-till farming allows the reduction of CO2 emissions to the atmosphere, noting that plants store CO2 in the ground. Working the ground releases the CO2 into the atmosphere. Now that we have implemented no-till and strip-till into our farming practices, we are essentially cutting back on the amount of CO2 that is released into the atmosphere during farming. Then when we grow our crops, more CO2 is pulled into the ground. Our fields are in fact air purifiers! By implementing this technology into our farming practices, we also cut back on our tractor and fuel usage. Using less fuel definitely helps cut our carbon footprint, and we are definitely using much less fuel on our dairy farm! As a caretaker of the environment, implementing these new practices into our farm was a logical and easy decision. Using no-till and strip till farming practices on our farm has allowed us to cut back our overall footprint on the environment in order to make for a brighter future for future generations. And we are proud of this fact! 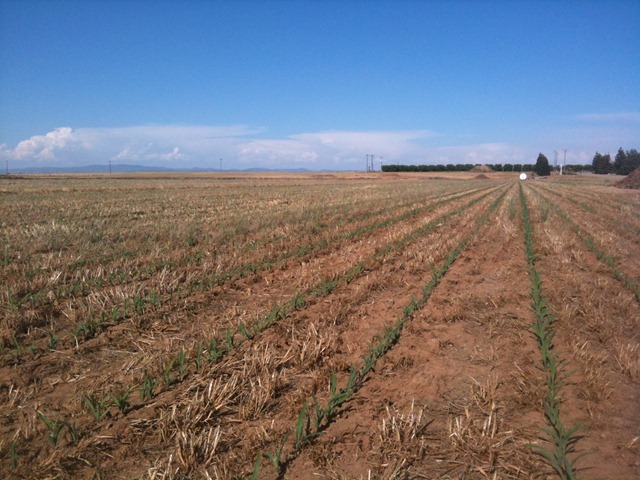 We recently cut our winter crop back in May, and just finished planting our corn in early June. The corn is now starting to come up. We will harvest the corn later this year. Note the picture below, you can see the remaining roots and stubble from our crop that we harvested last month in May (the brown). Then you can see the corn coming up in the rows! You can see there has been very little plowing or tillage done. Only a small slot so the corn could be planted and take root.